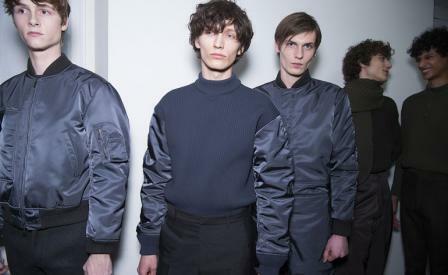 Mood board: Cool, clean and sharply cut, Rodolfo Paglialunga continues to steer the house of Jil Sander down a road of mannered minimalism, using pure blocks of tobacco, mud and steel grey to shape his urban uniforms. Best in show: While he opened with some fine separates suiting in thick wools clamped with cross body belts, the best looks in this show were the chunky knits and the ski-wear ready nylon pants and jackets that had a cool techno flair. Finishing touches: The models wore shiny lace-up shoes or polished boots, and carried rigid leather backpacks, all of which added a formal, polished counterpoint to the sport and military inflected clothes.